Cane sugar is used in baking to add greater levels of sweetness. Cane sugar is a highly refined, miniscule, white-granule sugar derived from the sugar cane plant. 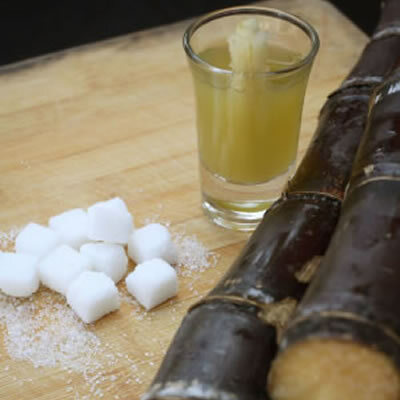 Sugar cane is primarily utilized in the baking industry as a flavor additive to implement greater levels of sweetness. Furthermore, one of the primary functions of cane sugar as an ingredient in baked goods is the functionality as a tenderizing agent, a moistener if used in liquid form, and a drying agent in granular form. To produce cane sugar, stalks of sugar cane are shredded, and by pressure of force, the sweet juice is extracted. The extracted liquid is then severely boiled until molasses-rich crystals form and settle. Once boiling commences, the molasses-rich sugar crystals are processed through a very rapidly spinning centrifuge, where the molasses separates leaving only the pure sugar crystals. The sugar crystals are then dried into the well-known granular form or left to be utilized as a liquid. Lesser-known functions of cane sugar include the dilution of flour and egg proteins such as in cake batters and possession of absorptive properties. Due to the absorptive properties of the sugar granule, sugar delays starch gelatinization. The delay of starch gelatinization caused by sugar content does not affect the high temperature at which gelatinization occurs, but affects only the rate at which gelatinization takes place. This is because the granules of sugar swell and take up water that would otherwise first be absorbed by the starch granules. Overall, cane sugar reacts with heat and moisture within baked goods in the oven and caramelizes to produce a desirable golden brown crust and enhances flavor. Enter your information below to receive your free download: Baking with Sweeteners from BAKERpedia. We will use this information to be in touch with you and to provide updates and marketing. Required fields are marked with a red asterisk (*).